BlasTech Industries designed the HSB-200 hold-out blaster pistol as a smaller, concealable version of the company's popular DL-44 heavy blaster pistol. However, the miniaturization process comes at a price. The smaller frame is unable to accommodate full-sized power distribution systems, resulting in loss of stopping and penetration force far in excess of size differential. While advertised as a hold-out blaster, the HSB-200 is relatively large when compared to other models in this category. In order to save credits on manufacturing, many DL-44 parts were directly incorporated into the new design. The result is a diminutive weapon with a full-sized barrel and handgrip. 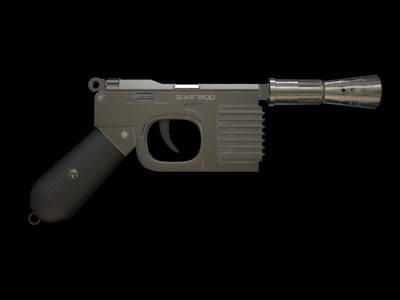 Following the collapse of the Old Republic, Imperial restrictions banned ownership and sale of many heavy blaster pistols, such as the DL-44. This lead to the popular belief that the over-sized design of the HSB-200 was intentional on the part of BlasTech Industries in an attempt to fill a niche in the market for legal hold-outs with the appearance of a heavy blaster.